CHICAGO/WASHINGTON (Reuters) - Teams from the three U.S. airlines that own 737 MAX jets headed to Boeing Co's factory in Renton, Washington, to review a software upgrade on Saturday, as U.S. regulators prepared to receive and review the fixes in coming weeks. 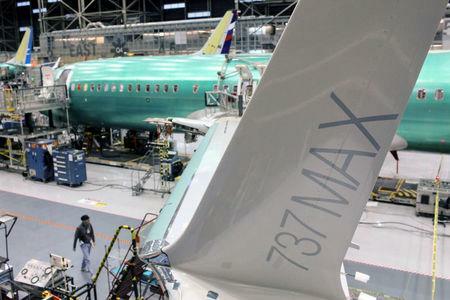 The factory visits indicated Boeing may be near completing a software patch for its newest 737 following a Lion Air crash that killed 189 people in Indonesia last October. This month, a second deadly crash involving an Ethiopian Airlines MAX in Addis Ababa triggered the fleet's worldwide grounding. Meanwhile, Southwest Airlines Co, the world's largest operator of the MAX, began parking its fleet at a facility in Victorville, California, at the southwestern edge of the Mojave Desert, to wait out the global grounding. Southwest has 34 of the jets; United Airlines has 14 and American Airlines has 24. "Right now we're in wait-and-see mode to see what Boeing comes up with," said Captain Jason Goldberg, spokesman for the APA, part of a delegation of airline safety experts and pilots set to test the upgrade. "We're hopeful, but at the same time the process can't be rushed." Southwest and United said they would also review documentation and training associated with Boeing's updates on Saturday.